Generally, the shorter the wavelength, the more biologically damaging UV radiation can be if it reaches the Earth in sufficient quantity. UV-A is the least damaging (longest wavelength) form of UV radiation and reaches the Earth in greatest quantity. 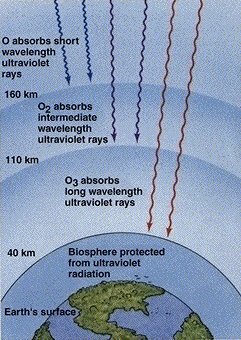 Most UV-A rays pass right through the ozone layer in the stratosphere. UV-B radiation can be very harmful. Fortunately, most of the sun’s UV-B radiation is absorbed by ozone in the stratosphere. UV-C radiation is potentially the most damaging because it is very energetic. Fortunately, all UV-C is absorbed by oxygen and ozone in the stratosphere and never reaches the Earth’s surface. 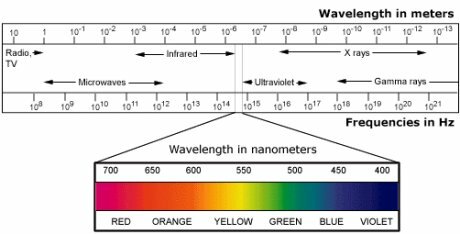 In summary, the danger from ultraviolet radiation comes mainly from the UV-B range of the spectrum, although UV-A poses some risk if exposure is long enough, or the sunshine is particularly strong. Influences on UV Radiation Reaching the Earth? Latitude: The sun’s rays are the most intense near the equator where they impact the Earth’s surface at the most direct angle. Season: During winter months, the sun’s rays strike at a more oblique angle than they do in the summer. This means that all solar radiation travels a longer path through the atmosphere to reach the Earth, and is therefore less intense. Time of day: Daily changes in the angle of the sun influence the amount of UV radiation that passes through the atmosphere. When the sun is low in the sky, its rays must travel a greater distance through the atmosphere and may be scattered and absorbed by water vapour and other atmospheric components. The greatest amount of UV reaches the Earth around midday when the sun is at its highest point. Altitude. The air is thinner and cleaner on a mountain top – more UV reaches there than at lower elevations. Cloud cover:. Clouds can have a marked impact on the amount of UV radiation that reaches the Earth’s surface; generally, thick clouds block more UV than thin cloud cover. Rain: Rainy conditions reduce the amount of UV transmission. Air pollution: Like clouds, urban smog can reduce the amount of UV radiation reaching the Earth. Land cover: Incoming UV radiation is reflected from most surfaces. Snow reflects up to 85 per cent, dry sand and concrete can reflect up to 12%. Water reflects only five per cent. Reflected UV can damage people, plants, and animals just as direct UV does.